Visit New Hampshire – home to Mount Washington, the highest mountain in the northeast. The White Mountain Region and Mt. Washington Valley features 48 mountains that are over 4000 feet high. New Hampshire is a hiker’s Heaven. The dramatic Franconia Notch, Flume Gorge, the Basin (a whirlpool-like waterfall believed to be formed nearly 15,000 years ago), and the Indian Head Profile, are all located in Franconia Notch State Park – just a 90 minute drive from Manchester – the largest city in the state. New Hampshire’s numerous galleries, antique shops, village stores, restaurants, inns, hotels and grand resorts are world famous. The New Hampshire lodging choices are as big as the White Mountains. Whether you are visiting Concord, Nashua, Manchester, Salem, Portsmouth, the White Mountain or the Great North Woods, you’ll find the guaranteed lowest lodging rates by clicking on the links below. 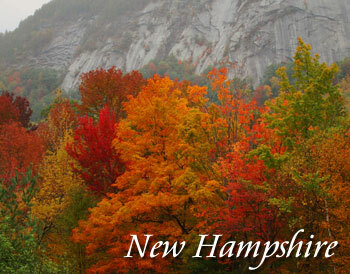 Choose from New Hampshire hotels, resorts, motels, motor inns, and destination lodges. The capital of New Hampshire, Concord is famous each presidential election, as the entire state is always the first to cast votes in the primaries. Originally settled by the Abenaki tribe of Native Americans, this area of Merrimack Valley NH is rich with history and culture. From the State Capitol Building to the Capitol Center for the Arts, there's always something to see and do in Concord. Great lodging and dining abound in this little city as well. The rugged White Mountains of northern New Hampshire are a famous ski getaway destination. NH ski resorts include: Loon Mountain, Bretton Woods Ski Resort, Attitash, Wildcat and the ever challenging Cannon Mountain. NH offers a great selection of superb ski vacation destinations.